Bathrooms today are no longer simply utilitarian rooms for a quick morning shower but a personal retreat where busy people can find a little ‘me-time’ to relax and recharge. If you’re building a new luxury home, choosing the right basins, baths and fittings can create a bathroom that’s both practical and pampering. Bathroom basins, baths and fittings can help set the mood for the bathroom you’ve always wanted. But after looking at the overwhelming range of options available today you may feel you need to take a cold shower! Happily, the process can be a pleasurable one – more like a warm bubble bath – when you build with Rosmond Homes. We provide you with an interior designer to advise and guide you on making the selections for your bathroom. It all happens at our Pre-Start Meeting. 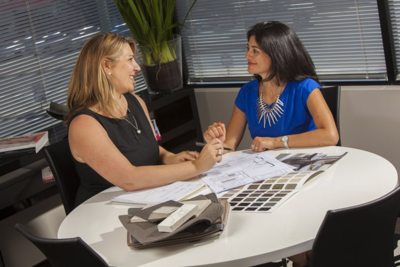 Pre-Start is when the colours and materials for your new home are selected and finalised. Our designer will consider your lifestyle habits and personal style, listening to your ideas and visions for your finished home. It’s a collaborative process and our designers make an enormous effort to understand each client’s individual taste, personality and aspirations, ensuring the recommendations are perfectly matched. What good is a bathroom that’s beautiful if it doesn’t have brains as well? 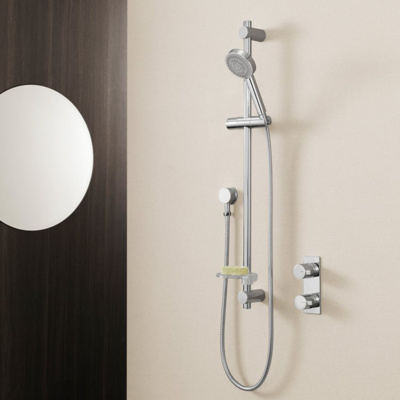 Practicalities such as sliding showerheads on a pole to cater for family members of different heights, easy to operate taps and non-slip surfaces are every bit as important as stunning looks. Environmentally friendly, waterwise products are also important and can conserve water through clever design. Rosmond’s interior designer will help you find the balance between the functional and the fabulous. Browsing the internet is a great way to update yourself on the latest product trends. 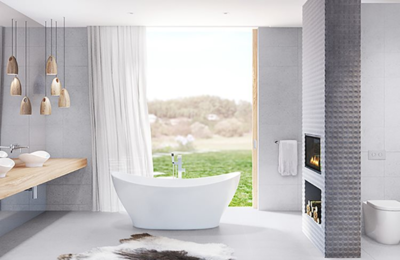 Iconic Australian company Caroma is one of Rosmond trusted suppliers of bathroom fittings with everything from quality classics to statement pieces inspired by leading edge European design. Browse the complete range of Caroma bathroom fittings. As our name suggests, Rosmond Custom Homes provides a level of individual service and customisation that allows you to personalise your new home to suit your own personality and preferences. With so many beautiful basins, baths and fittings available, there’s never been a better time to create a private sanctuary to soothe body and soul.